The HNTB+MVVA design features a single span across a highway; there’s no central pier. “This single span is a unique feature that will provide a much safer experience for drivers by creating a more open experience.” The winning team’s design is innovative because it’s approximately four times wider than other crossing structures and includes fences that guide different types of wildlife across through safe passages. “This provides an ideal setting to accommodate wildlife movement and a diversity of habitats on top of the bridge.” The design was also judged to be among the more sustainable and low-cost options with its use of pre-fit modular concrete pieces. The next step will be to implement the design somewhere in Colorado. 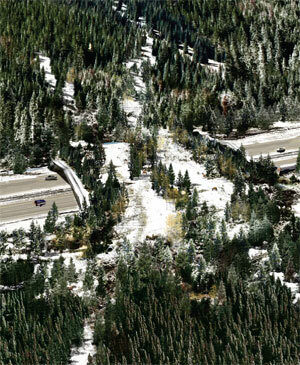 The design competition’s site is West Vail Pass on I-70 in Colorado, about 90 miles west of Denver. The site was selected from a range of candidates. HNTB and Michael Van Valkenburgh Associates received prize money and a preferential position for an upcoming state-financed wildlife crossing project on a site yet to be determined in the state. Clearly, there are numerous opportunities to deploy this solution, saving the lives of wildlife, which almost invariably die in these traffic accidents, and drivers in the process. Crafting a public-private financing model for the widespread roll-out of these overpasses should be a priority. Learn more about the winning design concept, and explore ideas discussed in a conference on wildlife habitat and crossing design held last year. Image credits: HNTB and Michael Van Valkenburgh Associates, Inc. 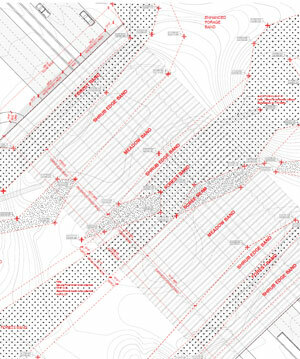 This reminds me of Halprin’s Seattle Freeway Park. A good sensitive design concept, however my state (WV) leads the nation annually in auto insurance losses due to deer/car collisions and I don’t see the state building these crossing facilities on its rural roads and interstates. Besides the immense cost, most of the highways in the state would be “tunneled” by these crossings. Perhaps having a better understanding of the movements of deer and other fauna prior to highway and roadway route planning would help to avoid many of these issues in the selection of the route or in making the initial investment decision in the first place…….let’s not forget the benefits of smart data collection in the initial planning process if we are truly concerned about collisions with wildlife. Yes, analysis about these potential problems prior to highway construction would have been great. Thinking retrospectively. Thinking for the short and long-term futures, this is a facile argument. There are currently almost ZERO new highways being built that could leverage this analysis. The interstate system is an in-place infrastructure, therefore we must look for adaptive solutions to problems with the system. I think this project smartly adresses these problems with a feasible solution for ITS SITE.